If you know me, you know that I am a cat person. I love animals, generally, but I am partial to cats. I have five of them and am open to more (although I do not believe my husband shares that sentiment). There is nothing better than a purring cat! A couple of years ago, when Isaac was a baby, we went to a cat show in Raleigh. There are two different cat clubs there that host shows, and I'm not sure which one we attended. We had a great time, and met several people who were just there showing their pet cats. They told us it was a lot of fun and we should try it. I was sure there was no way we'd ever do that. I love my cats, but I like them at home, you know? They all hate to be groomed, and you have to groom show cats a lot. And clip their nails - that's a whole 'nother barrel of laughs. Apparently the girls have had the idea of showing a cat in the backs of their minds since then. We got a kitten from the local animal control in September 2010, and it didn't take long for them to start talking about showing her. They mentioned it a couple of times, and I said helpful things like "Mmm hmm" and tried to pretend I hadn't heard them, hoping they'd forget about it. 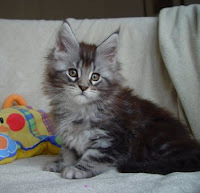 My children are nothing if not persistent, however, and they began to ask more specific questions regarding when, exactly, we might be able to take the kitten to a cat show and what we needed to do to get there. So, I sighed in resignation and began to do a little research in January. I learned that there was, indeed, a cat show in Raleigh in February, but we were a little late in signing up (not impossibly so, but enough that I could use it as an excuse to wait until the next one) and one in the town where we live in October. I made a deal with them that we'd go to the one in Raleigh and check it out, to see if they thought they really wanted to continue with their cat show plan, and then sign up for the local one if they thought it still sounded like a good idea. Off to Raleigh we went on Friday afternoon, to stay with some dear friends, have pizza, and then see some cats. Todd and I decided that it would probably be best not to take Isaac to the cat show, as his window for being quiet is quite limited and there were too many opportunities to hide, as he is wont to do these days, or otherwise run amok. Todd stayed with Isaac at our friends' house and they played while the girls and I headed off to the fair grounds and the cat show. We had such a good time! There were so many beautiful cats to see, both pets - many rescued - and purebred. I would have been willing to take home one of everything. There truly is something special and fun about each breed. There were also two local rescues present, which I thought was fabulous. I have to try not to get too close to them though because I always want one. I was going to try to list all the breeds we saw, but I didn't write them down and I'm not sure, looking at the list on The International Cat Association's website, if we saw some this year or the last time we went. I'd say my favorite cats this time around were the Bengals. They are lovely, active, friendly, playful SHORTHAIRED cats. They are a lot of fun! The most beautiful cat I saw there was Zabbie, a shaded silver British Shorthair. Her website is here. 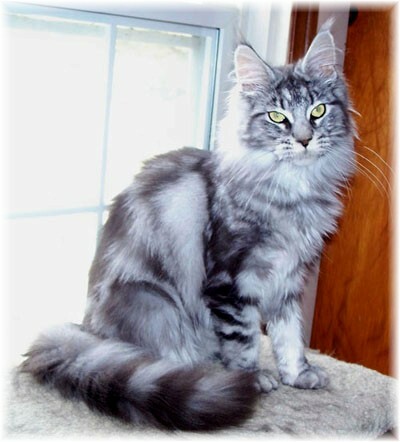 She's a kitten, and her mom wants to breed her, and is in the process of finding her a suitable mate. I adore silver cats. My Gabe, best cat EVER, was a silver tabby exotic shorthair. The British Shorthair breed was developed in Britain, and there are most certainly Persians in their origins. I think that's what I loved about Zabbie, besides her amazing color: her short nose. It's not squashed like a Persian's or an exotic's, which I love, but still short and cute. 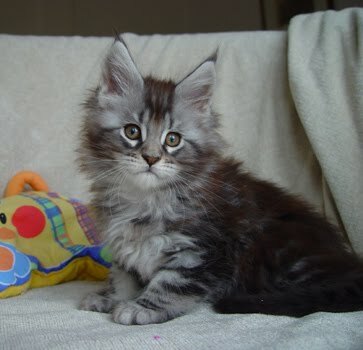 I think I could live with a cat like that. I have to say, though, that the BEST cat I saw all weekend was a rescue named Deacon, a cat who was rescued from a trailer park with several others where they were being used to train fighting dogs. That is a soap box for another day, so I won't get started. Marley's Cat Tales was one of the rescues there, and they had cages for 3 cats. The first time we stopped by, there were only two - Deacon and a lovely red Persian male named Sparky (I think). Sparky was lovely, but as much as I love my Persians, I am done with their crazy coats and especially Dory's weepy eyes and cat snot. (I am sure that's TMI, sorry.) Anyhoo, the very nice woman who was minding the cats let me hold Deacon, and I was instantly in love. He is a cuddler. There are not many cats who relish being held and petted, but Deacon positively reveled while we were bonding. He curled up on my chest, tucked his head under my chin, and proceeded to purr loudly and make happy feet. When he got tired of one position, he readjusted and we resumed our love fest. He is a solid cat - much heavier than you expect when you pick him up - and the most loving cat I've ever met. If I'd been allowed to take him then and there, nothing would have prevented me from doing so. However, there is an application process, and Todd is pretty sure we're not adopting him. I'm pretty sure I'd like to at least consider it, though, so I am going to contact them and find out if anyone else figured out how wonderful he is and adopted him first. This might be the longest post I've ever written! It has very little to do with homeschooling, except that the girls are possibly going to pursue showing cats, so I suppose I'll sign off and go make some dinner.